The Brussels attacks of March 22 hit the European city towards the fag end of the first round of UN-brokered Syria peace talks in Geneva. The attacks triggered a surprise visit to the city by EU’s foreign policy chief, Federica Mogherini, to convince delegations to negotiate and reach a settlement to put up a united front against the Islamic State, also known as ISIS and ISIL. The talks that formally began on March 9 were first in the sense of being the only time since the war began five years back that the negotiations were conducted under a “cessation of hostility” declared on February 27 that was, by and large, held by the warring parties, reflecting the possibility that the devastating war may be resolved through dialogue. The negotiations prior to the March 2016 talks collapsed only three days after they began on February 1 in the Swiss lake city. John Kerry, the US Secretary of State, along with Russian foreign minister Sergey Lavrov and a host of other diplomats from the so-called UN-recognised 18-member International Syria Support Group (ISSG) rushed to Munich and declared a partial ceasefire – that includes all parties except the Islamic State and Al-Nusra Front, both of which have been declared as ‘terrorist organisations’ by the UN Security Council (UNSC)– as well as a consensus for delivering humanitarian aid to 18 besieged and other hard-to-reach (HTR) areas. Though the UN emphasises the use of the term 'intra-Syrian talks' to describe the peace talks, the ISSG, ironically, comprises a large gamut of member countries – the Arab League, China, Egypt, the EU, France, Germany, Iran, Iraq, Italy, Jordan, Lebanon, Oman, Qatar, Russia, Saudi Arabia, Turkey, United Arab Emirates, the UK, the UN, and the US – which have a direct responsibility for the disastrous consequences of the war in Syria or, have been affected by it in some way and hold varying degrees of influence on the talks. The Munich conference also produced two vital task forces mediated by the UN: the humanitarian task force led by Jan Egeland, the secretary general of the Norwegian Refugee Council, and the ceasefire task force. The humanitarian task force is meant to coordinate and negotiate deliveries to areas sieged by opposition rebel forces sponsored by regional powers and areas sieged by the government forces. The ceasefire task force is meant to monitor ceasefire violations for which centres were established in Moscow, Amman and Damascus. Apart from stray incidents of violations, this time the cessation of hostilities – the UN is careful not to call it a ‘ceasefire’ – has been observed by all the major parties involved. As many as 86 groups in Syria had to acquiesce for such a cessation to hold. The peace talks were further bolstered when Russian president Vladimir Putin declared on March 15 that he was withdrawing majority of the ground troops from Syria and would direct air strikes only in ISIS-held territories. The negotiations, that saw participants trickling in only around March 14, were adjourned on March 24 for the second round to begin in the second week of April. The UN special envoy for Syria, Staffan de Mistura, on March 24 ended the talks with issuing a 12-point statement of guiding principles given to both the Syrian government and the Riyadh-sponsored High Negotiations Committee (HNC)– the main opposition group. The statement entitled ‘UN Special Envoy’s Paper on Points of Commonalities’ states that political transition will include the process for drafting a new constitution and free and fair elections pursuant to the new constitution as per UNSC resolution 2254 within 18 months, that no part of the national territory will be ceded, and that Syria will be a democratic, non-sectarian state based on citizenship and political pluralism, among other principles. The government delegation has gone back to Damascus to discuss the paper, and so has the HNC. However, the main sticking point through the just-concluded negotiations was the question of the Syrian president Bashar al-Assad’s role in the political transition and thereafter. This issue – which de Mistura refers to as the “mother of all issues”– is likely to remain one of the core points of rabid contention around which much diplomatic energy in future negotiations will be expended. 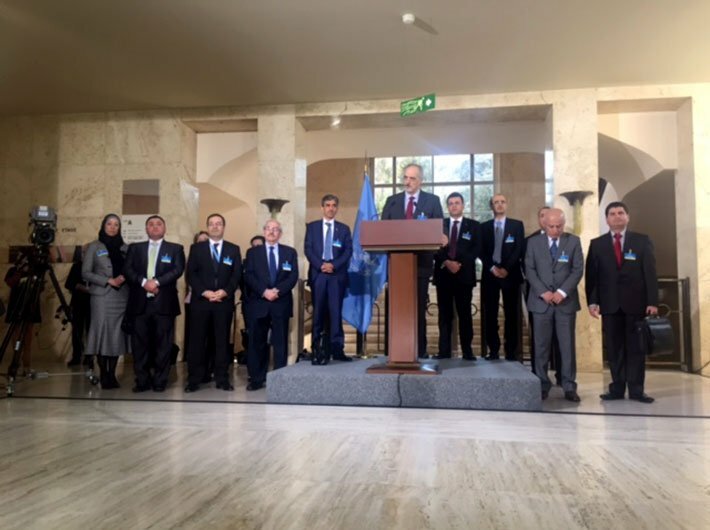 Bashar Ja’afari, the Syrian ambassador to the UN in New York and the government’s main negotiator in the Geneva talks, said on March 21, “The reference of our talks has nothing to do with President Assad in the intra-Syrian talks. This is something that is already excluded from the talks.” On the other hand, Mohammed Alloush, the chief negotiator among the 34-member HNC and the political leader of the powerful Saudi-backed group Jaysh al-Islam (Army of Islam), said that the talks on the transitional government would begin only after the death or imprisonment of Assad. Alloush’s elevation backed by the Saudi regime was controversial even among the opposition groups, which includes people like the former Syrian politician Riad Hijab, and was done, probably to spite the Syrian and the Russian regime. The Syrian regime considers Alloush a terrorist. Ja’afari has asked Alloush to apologise for his remarks. “We will not have direct talks till he apologises publicly and withdraws,” the diplomat said regarding his statement on Assad. The issue of detainees, held by both the government and the opposition groups, has also persistently made an appearance in the talks. There have been images of people kept in cages on rooftops by Alloush in his hometown of Douma. “I repeat how important it is for all of us and for the Syrian people, and frankly also for additional credibility for the political process, to see what we have not seen yet in Syria on either side, and which I have seen in every other conflict in my life history: a release of detainees or abducted people. And therefore this applies to both sides,” de Mistura said at the end of this round of talks. Even though the HNC is being considered as the main negotiating group among most of the international media because of its backing by the West and powerful regional governments like Saudi Arabia, Turkey and Qatar, the HNC itself is an umbrella group of rebel factions united in their opposition to Assad but often divided among themselves by politics and religion. Apart from the HNC, there are the Cairo-Moscow-Astana platforms which make up the moderate opposition. The group consists of influential names like Qadri Jamil, former deputy prime minister for economic affairs in Syria, and head of the Moscow group that consists of seven members, the Cairo group headed by former Syrian foreign ministry spokesperson Jihad Makdissi that consists of eight members, and the Astana platform headed by Franco-Syrian politician Randa Kassis that consists of seven members. “We are here as a negotiating group as part of the opposition,” Kassis told the press on March 17. “We have different backgrounds. We do not always agree on everything. The political situation in which we live in is very complex… we have different political positions but the basic references are Geneva and Vienna communiqués. We are not in competition with any other group,” Makdissi said. There is also, what the UN calls the ‘internal Damascus platform’. The group, however, prefers being called the internal Syrian opposition group. It consists, again, of groups of people from different walks of life but who have popular local base in Syria. They don’t oppose Assad as a president but want a change in the constitution. They are mostly secular, moderates who detest the idea of any kind of foreign intervention. “Assad is a Syrian citizen and is free to contest the elections if he wants to,” Nedal Naisseh, a former academic and member of the group, told Governance Now in an interview. “We don’t work for any other power. While others from the HNC have received from Riyadh 200,000 riyal each to participate in the talks, we represent the real people. Many members of the opposition have not even lived in Syria,” he added. “We don’t claim we are the only opposition group. But the HNC claims that,” he said. “The Syrians want people who care about them to represent them here. We are here and I believe we represent the whole people, all Syrians, and we will defend Syrians to the end,” he added. “The talks must be Syrian not foreign intervention. It violates the terms of reference of our talks. We should not re-invent the wheel,” Ja’afari said elucidating the wide gap that exists between the different parties and their positions. UNSC resolution 2254 directs that the UN mediator should engage with the broadest spectrum of stakeholders. De Mistura is meeting each delegation separately though amongst the opposition groups it has had the maximum number of meetings with the powerful HNC. The UN mediator is also attempting to include the Syrian Kurds in the talks. The Kurds have demanded a federal region within Syria for themselves. The US is using much of the Kurdish soldiers to fight off ISIS in the north. Turkey, however, has a long history of animosity with the Kurds and is vehemently opposed to the Kurds participating in the talks. “But I am leaving it frankly, since there are diverging positions regarding who should be invited or not last time I spoke to the Security Council. And when I was asked about it, and I was asked also how the Security Council could help me in advising me, I offered an advice on this. So I am waiting for their advice,” de Mistura said on March 24 on the issue of inviting Syrian Kurds to Geneva. “The wish of any mediator is to have possibly only two interlocutors; that makes life easy and simpler in analysing the options and the possible common ground. But I have to admit, in a conflict like this one… the situation in Syria due to these five years have polarised and fragmentised a lot,” de Mistura said to the press on March 24. Although the UNSC list only recognisesDaesh – the Arabic acronym for ISIS – and Al-Nusra Front as terrorist organisations, the Russian and the Syrian government consider many in the HNC as terrorists, including as mentioned above, Alloush. “Governments like Saudi Arabia support these opposition rebel groups within Syria. Nobody can convince another, including Syrian people that the Chechenyans, Moroccans, Saudis, Australians, Libyans [foreign fighters] belong to the Syrian moderate opposition. Why there isn’t a moderate armed opposition in France sponsored by other states and countries? Why not [on the] British soil, why not on US territories, why this kind of discrimination against Syrian people. When terrorists are active in Syria they are called moderate armed opposition, rebels, but never as terrorists. However, when those return to the home countries, their own country would call them terrorists,” Ja’afari told journalists during the talks. “We explained to Mistura the dangers of arming, training and exporting terrorism to Syria through Turkey. We have also explained the danger of extremist ideology that emanates from Wahhabis that is a danger to the world. Let’s not forget that the Al-Qaeda ideology is Wahhabi,” he added. Al-Muslet, in his turn, has called Assad a “murderer”. Naisseh and the internal opposition group are unanimous in calling Alloush a “man slaughterer” and “child killer”. “Those organisations, which are listed by the Security Council as terrorists are terrorists. The rest is a personal opinion, or a government opinion, but not the UN opinion,” de Mistura said. De Mistura, till now, has been holding so-called proximity talks – or ‘revolving door diplomacy’ –where none of the different groups meet each other but only talk to the UN mediator who keeps shuttling between one group to the other. Ja’afari said that the present rounds of talks were only about the form and not the substance of the process. The UN, however, differed from this assessment. They said that the fact that an eight-point government paper submitted to de Mistura at the beginning of the talks was discussed for long hours with the government delegation means that substantive talks have already begun. That de Mistura was able to get the belligerent parties to the same building if not the same room without walk-outs or run-ins in the past ten days should be considered an achievement in itself. Veteran diplomats like Lakhdar Brahimi and Kofi Annan, both former UN Syrian envoys had failed to do even that. This is what seems to have been the original intent of the first round of talks – the cessation of hostilities and the beginning of some contact between the parties. The fact that the fragile cessation of hostilities, by and large, is being respected by 86 armed groups, is a major breakthrough though it is unclear how long such a cessation would last if negotiations are not expedited. “You can’t sustain a cessation of hostilities in a conflict like the Syrian one, five years of horror – and you can’t therefore sustain the humanitarian aid, which is linked to access thanks to the reduction of violence, unless there is a political process,” de Mistura said. The second success has been an access, of some limited extent, of direly-needed humanitarian aid to besieged and HTR areas. “It used to be zero last year; we are close to reaching 3,84,000 people. Not enough, but moving – Darayya, for instance, Douma, but moving,” the UN official said. The talks are scheduled to re-start on April 9 but it is uncertain when the gamut of participants decide to drop in. The Syrian government has asked for a delay in starting the second round of talks due to the upcoming parliamentary elections in Syria but HNC seems to be in no mood to listen and has promised to land up in Geneva the day the talks resume. “I have been reminding everyone that there is no plan ‘B’, so the plan ‘B’ is basically getting through this,” de Mistura said. Apart from the talks within the UN premises, the two countries that have crucial influence on the talks, Russia and the US, are trying to shove forward the talks towards a faster pace. Kerry met Russian president Vladimir Putin on March 24 in Moscow in a four-hour meeting. Washington said that Moscow will help Assad take the “right decision”. “As for the most immediate tasks, we have agreed to work towards a speedy start of direct talks in Geneva between the government delegation and a whole specter of the opposition,” Lavrov told reporters in Moscow. Veteran diplomat Brahimi is also talking to some stakeholders in Paris to influence the warring parties. “Would you ever have dreamt just three, four, five months ago, that countries like Russia and the US would actually sit and seriously spend a lot of serious talks about how to end this conflict? Would you ever have dreamt to see in the same room Saudi Arabia, Iran, Qatar and Turkey and everyone else who has an influence in this conflict to spend seven and eight hours to discuss how to end this conflict? …So give us trust, and believe in it,” de Mistura said at the end of this round of Syria peace talks.